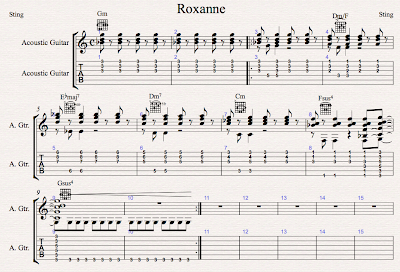 Here's a solo fingerstyle guitar arrangement for the first section of Roxanne, by the Police. If you click on the image of the score below, you'll get a bigger one you can print and place on your music stand. A couple things to note on technique. The right hand finger's play Andy's guitar part. I've made them eighth notes to emphasize the reggae scratch style brevity of the chords. You can accomplish this by using left hand muting, or by playing prepared strokes with the right hand fingers. When the bass line enters (use your thumb) I find that you get the most musical effect by emphasizing beat two: hold that chord a little longer, or for a full quarter note. It makes the beat extra fat, and gives the groove its funk. On beat 4 of measure 8, switch to frailing (strumming with your fingernails) for the Fsus4 and Gsus4 chords. Practice that crescendo at bars 9 and 10 with your thumb, and you'll really have something that sounds quite rocking. wake up to what Sting was doing!